I grew up in Angola – late '40s and 50's. I went to a mission boarding school in Zambia – then Northern Rhodesia. My first teacher, Standard 1 aged 7, was Lucy Traise. She was a "retired" Australian teacher. I came home to Angola with a thick Australian accent which lead to much mirth and teasing. They both begin and end with the letter "A". Once Australia and Angola were intimately connected. They both were once parts of the Great Southern Continent, Gondwanaland. The rocks and fossils tell the tale of the common boarders between the two, but this was rent asunder by the tectonic adjustments of the earth. Rift valleys, similar to that which runs through Africa all the way into Europe formed between the African Continent, and Australia, as well as between them and South America, Decan India and Antarctica. Just look at the globe and fit the continetal jigsaw together to see how it worked. The rifts grew wider and the continents floated away from one another. Work towards fulfilling the hope that the peoples of the two lands reforge the historic physical connection is aided by analogies such as this, together with the opportunity provided by CNN of focusing on the unity, rather than fragmentation of mankind. Angola is famous for Welwitschia Mirabilis, an astonishing desert plant, that only grows in Namibe province. Angola is also known for the palanca Negra Gigante which is the national icon of Angola, it is considered to be the most beautiful living antelope in the world. 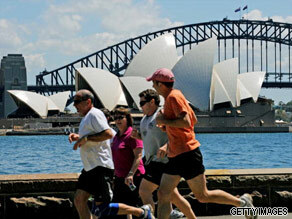 In the other hand Australia is famous for species such as koalas and kangaroos. Both have great mineral and energy wealth, both onshore and offshore. Huge reserves of gold, oil, gas. Both Angola and Australia have great traditional sporting rivalry with South Africa. Both have large ex-pat communities working in energy industry. Both have very expensive cities in Luanda and Sydney respectively, but for vastly different reasons. Majority of people in both countries found their belief in Christianity! also, both countries have been ruled by Europeans in the past. (Angola by Portuguese, Australia by British). Population numbers of both countries are similar too: Angola 19mil, Australia 22mil. Civil Engineering Equip & Parts. The picture showing a waterfall system in Angola was taken from the Namibian side. 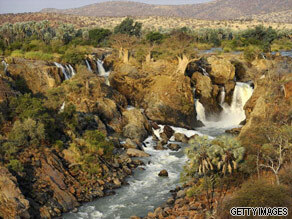 The waterfall is called Epupa Falls and runs off the Kunene River which, in that region, divides Angola from Namibia. While posted in Angola for military exercises during the war era, not too far from twhere this picture was taken, I was bitten by a puff adder and had to be urgently evacuated to Windhoek Hospital in Namibia (then South West Africa) where I spent some months recovering. Since that time I have viseted this area on numerous occasions to do wildlife photography. I now live in Australia. Mining sector is a key factor for both of their economies. Australian companies such as BHP Billiton are present in Angola which represents a connection between both countries. They are both relatively dry countries and that's about where any connection ends. I know where I'd rather live! Australia and Angola are both situated in the southern hemisphere, therefore they share the same seasons at about the same time of the year. They are also located on the same latitude. They also have great natural scenic beauty not to mention that they are also both very rich in raw material and mineral resources. They where both colonised by European countries. Both Australia (Sabrina Houssami) and Angola (Stiviandra Oliveira) placed in the top 6 of the Miss World 2006 pageant. as an Angolan i would love to know more about Australia too!! Many Angolans migrated to Brazil... Brazilians LOVE BBQ's... so do Australians. We don't see much of a connection here but I do see that Angola has diamond mines and Australia has the machinery and the expertise to dig them out and provide a good source of income to Angola and Austraila. Both have good decent basketball teams! I spent sometime working in Angola , I then went to Australia to work met someone there got married returned to Angola where my first child was born we now live in England! Australia is the most peaceful country I have ever heard in history-no wars, no conflicts. It runs itself quietly with self respect. that is why I find it a nice continent. Angola is characterized with peaceful relations also. Historically and on the political arena both deserves Noble Peace Prize! It would be good to promote sister cities and townships for both countries. Being at the same latitude Australia could help in economic areas where as Angola could assist with culture and environmental. A type of ying and yang. Both complimenting each others strengths and weaknesses. Portugal is said to once "discoved" australia when it was around the timor islands. Angola was a former colony of the portuguese and now speak portuguese. There was a Dutch presence in both Angola and Australia in the 16th century.However neither was colonized by the Dutch. Anthony from nigeria;angola&australia have many things in common.example is the area of sports:angola are specialist in the area of basketball while australia are the best in swimming,ranked 1st in the world.2:they also share the same border according to evolutionary records,which no longer exists due to the conflicts in angola in the previous decades and the global warming affecting the entire world.3:their name starts with a,they also have two cities which are pleasurable for your leisure.4;they both have wild animals that are not common in their area.angola has the greyrious gazelle,while the goalla & kangaroo is in the australia. First europeans to arrive to both countries were the Portuguese. I don't know about a connection but I love angolan kuduro!! Your Christian reference is fictional. The Majority of the country is not Christian at all, in fact, most would laugh at your Religions. The only connection l can figure out is..."there is Embassy of Austrialia in Angola, likewise, there is Embassy of Angola in Australia" which connected the two countries together. Luanda is the most expensive city in the world. well, i guess sydney has even brighter streets. The major similarity is basically the fact that both countries just like others have abolished the death penalty. I'm from Angola and I love this country. Yes, our economy is growing exponentially but unfortunately we don't feel it. The majority of our population is still living in poor condition due to the lack of transparency. The corruption and the bad way of managing our richness have been the biggest concerns. I understand about the Angolan economy, as Angolan im shockt that how come on CNN they never talk about Angolan corruption as well and the president is more than 30 year in power, and nobody seems to care, the people are starving in Angolan everyday. angola and australia are both 3 syllabic words. I couldn't imagine how anyone can survive in Angola I read your comment. Puts our plights in perspective. Power & gas bills shoot through the roof, housing rental shortage & landlands can kick you out at will to jack up prices, GFC figures released ot world bogus, stimulus programs cause massive waste in schools who didn't get what they requested & 5 deaths from dodgy housing insulation program & a Govt hell bent on slugging us with a carbon tax that will destroy businesses. Relaxed?? Reading about both plights I guess the one thing we have in common is not being so. Australian had merchandise trade with Angola in 2009 Exports to Angola(A$'000) 11,136.Total exports and imports 11,165. As It was already said on Angolan day of independence Angola will be a potential of Africa and the world, this statement made clear that Angolans were prepared to show there potential, civil war broke in and the statement was almost forgotten , but during this time(civil war) Angola took apart in many benefited events, even though fighting against civil war, after the rain comes rainbow, time for reconstruction and being one of the most richest resource country in the world theirs high possibilities of developing, since peace Angola dramatically changed (infra-structures, roads), with great economic BOOM, political, touristic and etc. Do businessess actually pay individuals to take surveys online? I was recommended this blog through my cousin. I am now not sure whether this post is written by means of him as nobody else know such detailed about my difficulty. You are amazing! Thanks!